Whether you identify as LGBT or not, if you live in this century you’re aware of LGBT issues. From pride parades to gay marriage, queer people are more visible than ever, with tens of thousands bravely stepping out of the closet and into the public eye, both in the secular world and in the Jewish community. Because of this, Andrew Ramer’s Queering the Text is both timely and timeless. 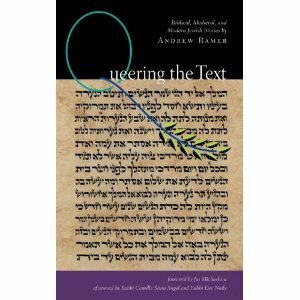 For anyone who can’t imagine there being room for LGBT people in Jewish tradition, or for anyone who longs to find some ancestor sashaying through Jewish history, Ramer’s imaginative prose brings gay Jews to life with tender and realistic descriptions of biblical, medieval, and modern Jews. The stories are as beautiful as they are validating, and in portraying vivid and complex characters beautifully, Ramer respectfully demonstrates that there is room for LGBT characters throughout Jewish tradition. His descriptions are satisfying; relationships aren’t perfect, and even characters in Biblical times bicker and struggle. However, the struggles and imperfections make Ramer’s book all the more real, and he succeeds brilliantly in normalizing gay Jewish characters, gay Jewish relationships, and gay Jewish life. I say “gay” rather than “queer” for a reason. Unfortunately, the book offers far more descriptions of gay male characters than anyone else. Though there are attempts to include lesbians and transgender characters, the descriptions don’t feel as intimate as the male ones. The medieval section in particular contains story after story of dark-eyed young men stealing glances from each other in marketplaces or beit midrashes, but almost no dark-eyed young women or transgender folks appear. When women do surface, their stories seem narrated by someone distant, someone who respects their love as legitimate, but not someone who is attracted to them. I’d like to give Ramer the benefit of the doubt here—I assume he’s writing what he knows, and he neither oversteps his knowledge nor objectifies women in his book. However, as a ciswoman, I still felt a little left out upon reading the text. Overall, though, Ramer’s book is a beautiful and inclusive work. Reading Queering the Text feels as validating as being shown an old family photograph and being told, “you have his smile,” and it is an important book for everyone who respects biblical tradition but wishes to find room for LGBT people. How is it possible to be both queer and strongly Jewish? Queering the Text is how.